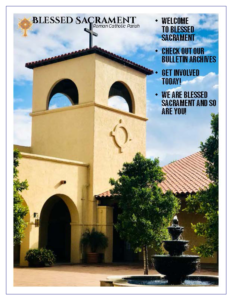 Want to Know More About Blessed Sacrament? A work in progress, please check back soon. For a brief overview of sacraments, click here. Please contact your local funeral home to set up a date for the service. The funeral home will then contact Blessed Sacrament to coordinate and confirm the date. Blessed Sacrament will contact you to determine details for the Mass. Your family will be asked to select readings and music. You may access those selections by clicking below. Click here to go through the Reading & Music Selections. Call Heather Fraher, the School Director, for a tour of the school today at (480) 998-9466. Registration and Scholarship forms are below. Have a birthday coming up? Perhaps an anniversary or another special celebration? Looking for a way to participate in the Mass with your spouse, friends, or family? Please sign up to bring up the gifts at Mass! Click on the link below to go to our SignupGenius page. Scroll through to find the day/time that you’d like to bring up the gifts. Click “sign up” then check the box next to “sign up” for the time that you’re choosing. Click “submit & sign up” then follow the prompts asking for your contact information. We’ll send you a reminder with instructions a couple of days before the day you’ve chosen. Essentially, you’ll need to arrive at least 10 minute before Mass begins and check in with the ushers (whom you should find in the back of the church). They’ll give you specific instructions at that time. There’s no speaking and very little lifting involved, but you are bringing forth the gifts of the community – the bread, the wine, the collection – our offering to God at the Mass! This is an incredibly important role and we are grateful for your help! Attention 6th, 7th & 8th Graders! You are invited to an amazing ministry designed just for you. EDGE is brought to you by Life Teen and the year will include Retreats, Camp, Service projects and a lot of crazy games! Edge meets on Mondays at 6:30pm in the Teen Room. Click on the forms below to register or contact Jeremy Stafford at (480) 948-8370. Life Teen is an amazing ministry to the High School youth of Blessed Sacrament and beyond. We are going to have a lot of fun this year. We will have retreats, Steubenville West and the famous Life Teen Summer Camp. Yes, you get to leave the HOT state of AZ and go to California for a week! Life teen meets on Sundays at 6:15pm in the Teen Room. Register using the forms below or call Jeremy Stafford for more information at (480) 948-8370. Is your child in first through fifth-grade? Contact Isabella Rice today at (480) 948-8370. Sign up for the Weekly Email Newsletter!